In March when I was 7 months pregnant, I decided that I had to have a rebar arbor (nesting for me was about soaker hoses and timers) my lovely husband poured the concrete and held the ladder steady while I tottered at the top. I hope that the arbor will be smothered in the Zephirin Drouhin roses that I planted at each corner. Right now it is covered with Heavenly Blue morning Glories and Scarlet Cardinal Vines. Hi Jen! I love your arbor. I too, use rebar for arbors but I love the style of yours. I'll probably steal the idea for the middle of an herb bed. Love your blog! 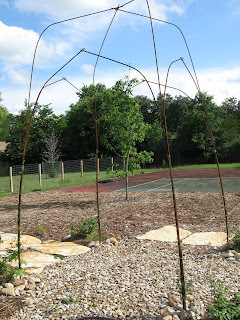 Your rebar arbor is fabulous! So stylish. How did you bend the rebar so neatly? Did you use a rebar tool?